This article initially posted on Medium. This week, Industrial Toys launches its first title, Midnight Star. 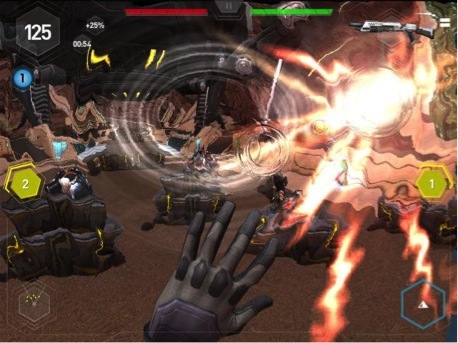 It’s a high production value first-person action game that mixes awesome graphics and sound with a fun gameplay – pushing the processing power and GPU of mobile and tablet hardware. While it’s the culmination of months of creativity and hard work, we think it’s just the beginning of a new era in mobile gaming. If you’ve watched the app stores these past few years, you’ve seen gaming has dominated both iOS and Android. From flying birds to clashing clans, we’ve seen large, independent (and very profitable) companies emerge by marrying great “snackable content” with the outstanding economics of mobile platforms. As a Series A investor in both Rovio and Supercell, we had a front row seat to two of the preeminent mobile gaming brands of this era. But as mobile gaming unlocked and catered to millions of casual and “mid-core” players, the core gamers have sat on the sideline – a big missed opportunity, given they represent the vast majority of the $90+ billion in annual spend in the games market. For them, PCs and consoles are still front and center: content is highly immersive, narrative-driven and character-led, and communities are deep and engaged. Enter Industrial Toys. They’re taking advantage of the steep slope of mobile hardware (today’s iPhone 6/A8 chipset is roughly equivalent to the Playstation 3) with bigger screens, better battery life and near-ubiquitous broadband. They’re hyper focused on community, bottling all the great energy among their gamers to create a second-layer of connectivity and engagement. And led by the original creator of Halo, they’ve built a team of creatives who know how to build great games that tell a rich story. We’re excited to see the launch of Midnight Starsince Industrial Toys is lighting the way for a new generation of studios to push the envelope on content and production-value and finally reach an audience that’s been under served in this shift to mobile.